Epoch (K. Holewczynski) is a man with a manifesto and a mission. 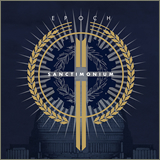 Musically charging into the fray to unveil “the obvious overreach of U.S. and its allies’ influence in world affairs under the guise of the protection of democracy and freedom,” on Sanctimonium Epoch comes armed with martial dark ambient and thumping EDM overtones. His sound, as always, is big and bold. There is a story to be told here, and it plays out in soundbites, the spoken-word dogma of the aggressor chopped, sliced and shuffled into an appropriately bombastic framework. Where this release excels is in how Holewczynski metes out the pace of the story. It would be easy to just go heavy on the dark pads, layer jt all up and overload the thing with howitzer barrages of percussion and let it go, but the artist takes the time to craft the thing with a cinematic mindset. There are quieter parts, and there is a rush of action–check out the crowd-chant frenzy in the middle of “Disciples of Mars” as Holewczynski fills the background with urgent strings. A great drop lands, and then the sonic shelling starts. I love the repetition of “A New World order is coming into being” here–this Truth is being drummed into your head. There’s dark wit here, as well–“All Heil the Chief” takes the known song, harshens up the edges, then fades it into a lock-step, gather-the-troops military tattoo complete with crowd calls and more political split-tongue speech work. Sanctimonium, and Epoch’s work in general, isn’t for everyone. There is a disturbing aspect to it, a constant through-line of darkness and uncertainty as Holewczynski presents his version of tugging back the veil and showing you that everything you know might be wrong. The music is very intense, to say the least, and Epoch fully understands how things like anthems affect our psyche. Music has always been used as a way to stir souls to whatever end; here, it is used to make you sit up and listen to what’s being said. Listeners comfortable with dark(er) ambient will enjoy this more, but if you’re interested in being challenged, start here. Another strong bit of martial darkness from Epoch. Available from Carbon 12 Records.